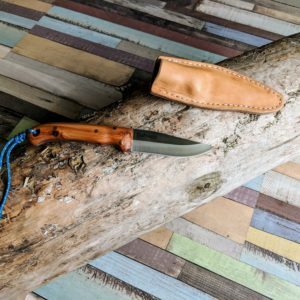 This Knife has been hand made using a full tang Stainless steel blade from Knivvegg, It’s been mated with a stunning African hardwood handle that’s been brass riveted for a comfortable and stable grip, it come with a handmade leather Sheath with a oiled finish for durability. 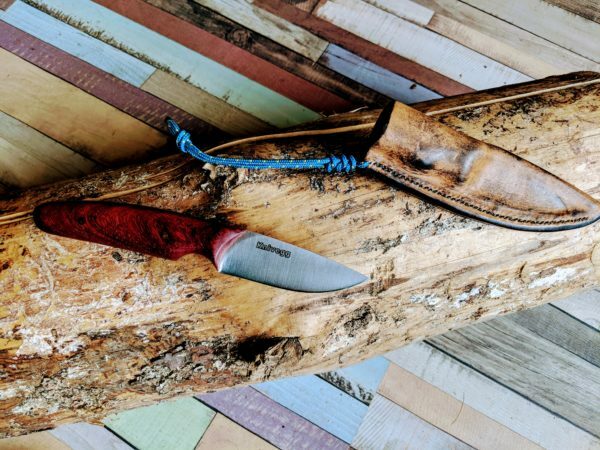 Being an outdoor person I think having a good quality knife is a must and as I work with wood a lot I thought I will give it a go and make some. As I don’t have my own forge yet I just buy the blade blanks. Then I go and choose the wood for handles, I try to look for something with nice features cut them out rough and drill the holes for pins. I use epoxy resin glue to glue the rough shaped handles on to the blade and leave it harden. after that comes the sanding and more sanding. once I am happy with the shape I apply up to 6 coats of Danish oil with a polish in between. Sheaths are made from natural veg tan leather, hand stitched and wet formed around the knife. Once the leather is dried I either oil it or wax it to make it waterproof. When everything is done I strop the blades until they are razor sharp as blunt knife is more dangerous than a sharp one. I hope my knife will last you a lifetime and more. And if by any chance something goes wrong with it I am happy to repair it free of charge or for a small amount depending on s damage. Please note these items are collect only from the Shop… and you may be required to prove you age…. I will not ship these in the post..